Quartet Vocals US originaire de Malden (Massachusetts) et composé des frères Joe (3 Mai 1921 - 22 Décembre 2007), Gene (13 Février 1923 - 4 Avril 1997), Vic (20 Mai 1925 - 23 Janvier 1978) et Ed (9 Juillet 1927). 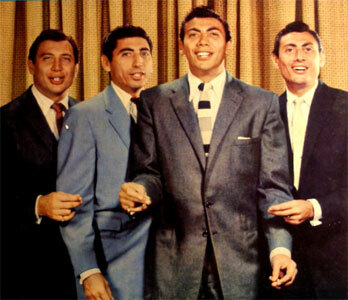 A close-harmony Vocals quartet with few equals during the '50s, the Ames Brothers hit number one in 1950 with "Sentimental Me," and found their biggest hit three years later with "You, You, You." Though they were indeed a family group, the Ames Brothers' surname was actually Urick. Joe, Gene, Vic and Ed were all born within four short years of each other in Malden, Massachusetts. After winning a few talent contests in their hometown, the group moved to Boston and began performing in nightclubs. They soon made the leap to New York and even Los Angeles, and signed to the Coral label in late 1958. 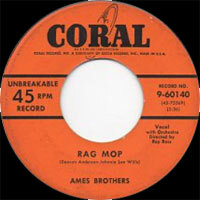 After a few moderate hits, the Ames Brothers hit big in early 1950 with a double-sided number one hit, "Rag Mop"/"Sentimental Me." 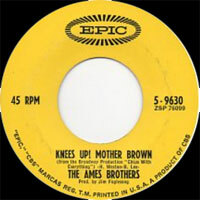 The B-side eventually triumphed over its flip, and the group hit again later in 1951 with "Undecided." The biggest hit of the Ames Brothers' career was 1953's "You You You," and their continued success during 1954 with "The Naughty Lady of Shady Land" bore fruit in the form of their own television program. Though the quartet continued to record throughout the '50s, the dawn of the rock era definitely damaged their career; the group managed two Top Ten hits in 1957 ("Tammy," "Melodie d'Amour"), but then folded in 1959. Ed, the youngest Ames brother, continued a performing career and appeared as an Indian named Mingo on the Daniel Boone TV series before hitting the Top Ten as a solo act with 1967's "My Cup Runneth Over." He also appeared on Broadway. 1946 78 t. MAJESTIC 7254 (US) . 1946 78 t. AMES BROTHERS 1104 (US) . 01/1949 78 t. Coral 60015 (US) . 01/1949 78 t. Coral 60016 (US) . 01/1949 78 t. Coral 60017 (US) . 03/1949 78 t. Coral 60035 (US) . 03/1949 78 t. Coral 60036 (US) . 05/1949 78 t. Coral 60052 (US) . 07/1949 78 t. Coral 60065 (US) . 09/1949 78 t. Coral 60091 (US) . 09/1949 78 t. Coral 60092 (US) . 11/1949 78 t. Coral 60113 (US) . 11/1949 78 t. Coral 60114 (US) . 01/1950 78 t. Coral 60140 (US) . 02/1950 78 t. Coral 60153 (US) . 02/1950 78 t. Coral 60154 (US) . 1950 78 t. Coral 60164 (US) . 03/1950 78 t. Coral 60173 (US) . 1950 78 t. Coral 60185 (US) . 05/1950 78 t. Coral 60209 (US) . 1950 78 t. Coral 60212 (US) . 07/1950 78 t. Coral 60253 (US) . 11/1950 78 t. Coral 60300 (US) . 11/1950 78 t. Coral 60267 (US) . 11/1950 78 t. Coral 60268 (US) . 11/1950 78 t. Coral 60269 (US) . 11/1950 78 t. Coral 60270 (US) . 11/1950 78 t. Coral 60327 (US) . 11/1950 78 t. Coral 60333 (US) . 11/1950 78 t. Coral 60336 (US) . 11/1950 78 t. Coral 60337 (US) . 11/1950 78 t. Coral 60338 (US) . 11/1950 78 t. Coral 60339 (US) . 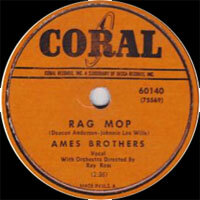 12/1950 78 t. Coral 60352 (US) . 01/1951 78 t. Coral 60363 (US) . 1951 78 t. Coral 60385 (US) . 1951 78 t. Coral 60386 (US) . 02/1951 78 t. Coral 60387 (US) . 1951 78 t. Coral 60388 (US) . 1951 78 t. Coral 60397 (US) . 1951 78 t. Coral 60398 (US) . 1951 78 t. Coral 60399 (US) . 1951 78 t. Coral 60400 (US) . 03/1951 78 t. Coral 60404 (US) . 1951 78 t. Coral 60452 (US) . 05/1951 78 t. Coral 60489 (US) . 07/1951 78 t. Coral 60510 (US) . 07/1951 78 t. Coral 60511 (US) . 07/1951 78 t. Coral 60512 (US) . 07/1951 78 t. Coral 60513 (US) . 08/1951 78 t. Coral 60549 (US) . 1951 78 t. Coral 60566 (US) . 11/1951 78 t. Coral 60572 (US) . 01/1952 78 t. Coral 60617 (US) . 1952 78 t. Coral 60628 (US) . 1952 78 t. Coral 60633 (US) . 1952 78 t. Coral 60634 (US) . 1952 78 t. Coral 60635 (US) . 1952 78 t. Coral 60636 (US) . 1952 78 t. Coral 60680 (US) . 1952 78 t. Coral 60751 (US) . 07/1952 78 t. Coral 60773 (US) . 08/1952 78 t. Coral 60804 (US) . 09/1952 78 t. Coral 60846 (US) . 11/1952 78 t. Coral 60861 (US) . 1952 78 t. Coral 60870 (US) . 1952 78 t. Coral 60885 (US) . 1952 78 t. Coral 60886 (US) . 1952 78 t. Coral 60887 (US) . 1952 78 t. Coral 60888 (US) . 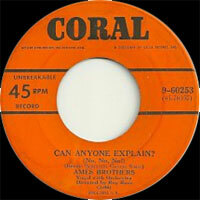 01/1953 78 t. Coral 60926 (US) . 04/1953 78 t. Coral 60967 (US) . 1953 78 t. Coral 61005 (US) . 1953 SP Coral 9-61005 (US) . 1953 78 t. Coral 61127 (US) . 1953 78 t. Coral 61145 (US) . 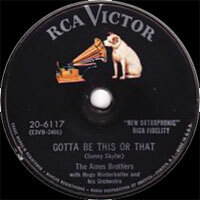 05/1953 78 t. RCA VICTOR 20-5325 (US) . 08/1953 78 t. RCA VICTOR 20-5404 (US) . 11/1953 78 t. RCA VICTOR 20-5530 (US) . 02/1954 78 t. RCA VICTOR 20-5644 (US) . 06/1954 78 t. RCA VICTOR 20-5764 (US) . 09/1954 78 t. RCA VICTOR 20-5840 (US) . 11/1954 78 t. RCA VICTOR 20-5897 (US) . 11/1954 78 t. RCA VICTOR 20-5929 (US) . 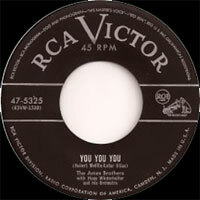 03/1955 78 t. RCA VICTOR 20-6044 (US) . 05/1955 78 t. RCA VICTOR 20-6117 (US) . 06/1955 78 t. RCA VICTOR 20-6156 (US) . 08/1955 78 t. RCA VICTOR 20-6208 (US) . 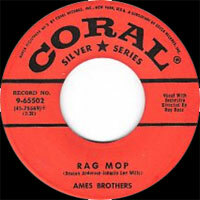 11/1955 78 t. RCA VICTOR 20-6323 (US) . 1955 SP RCA VICTOR 447-0310 (US) . 01/1956 78 t. RCA VICTOR 20-6400 (US) . 03/1956 78 t. RCA VICTOR 20-6481 (US) . 1956 SP Coral 9-61723 (US) . 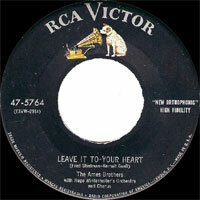 05/1956 78 t. RCA VICTOR 20-6566 (US) . I Couldn’t Sleep A Wink Last Night / ? 05/1956 SP RCA VICTOR 47-6566 (US) . I Couldn’t Sleep A Wink Last Night / ? 07/1956 78 t. RCA VICTOR 20-6608 (US) . 11/1956 78 t. RCA VICTOR 20-6720 (US) . 02/1957 78 t. RCA VICTOR 20-6821 (US) . 03/1957 78 t. RCA VICTOR 20-6851 (US) . 05/1957 78 t. RCA VICTOR 20-6930 (US) . 10/1957 78 t. RCA VICTOR 20-7046 (US) . 01/1958 78 t. RCA VICTOR 20-7142 (US) . 02/1958 78 t. RCA VICTOR 20-7167 (US) . 06/1958 78 t. RCA VICTOR 20-7268 (US) . 08/1958 SP RCA VICTOR 47-7315 (US) . 10/1958 SP RCA VICTOR 47-7365 (US) . 11/1958 SP RCA VICTOR 47-7413 (US) . 02/1959 SP RCA VICTOR 47-7474 (US) . 05/1959 SP RCA VICTOR 47-7526 (US) . 07/1959 SP RCA VICTOR 47-7565 (US) . 09/1959 SP RCA VICTOR 47-7604 (US) . 01/1960 SP RCA VICTOR 47-7680 (US) . 07/1960 SP RCA VICTOR 47-7766 (US) . 10/1960 SP RCA VICTOR 47-7801 (US) . 01/1961 SP RCA VICTOR 47-7836 (US) . 1963 SP EPIC 5-9591 (US) . 10/1963 SP EPIC 5-9630 (US) . 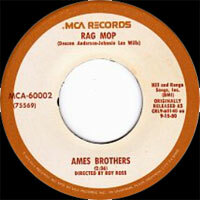 The Ames Brothers - It Must Be True / The Alphabet / Ol’ Man River / Noche De Ronda / That’s The Way Love Goes / Why Do I Keep Lovin’ You / Gotta Be This Or That / Anniversary Song / Love Your Magic Spell Is Everywhere / I Can’t Give You Anything But Love / I’ll Never Get You Off My Mind / Not You, Not I.